Ezine Act 51 Explains that Dictatorship Crimes Are Not Ethnical Cleansing! Here is the Ezine Act 51. There are some editions of the political newsletter on this website. I re-edited this page 12 years later to include some updates here about moving many of the political pages from the Ezine Act's Network to a political website with a political theme focused on the Horn of Africa. Through the emails sent to the Ezine Act's list, subscribers know the development at the entire of Khalid Osman's Network. So, this preamble is somewhat necessary for other visitors to note that one of the Ezine Act Newsletters has been changed to the HOA Political Scene Newsletter to be the voice of the political website. It is a worthy note also to mentioned the history of this newsletter, as it has been started not on the Ezine Act, Politics, Business and Love, but at a website I had before called child's book publishing ezine. It was the first site I started at the beginning of the 21st century. Your Ezine Act 51 is now back on its own web site. We host it a couple of weeks at our deleted website, child-book-publishing-ezine.com. It is now here until we move it to its own website and maybe rename it. Since you know from the updates of the Ezine Act and Biz Marketing Newsletters about our future plans, so you'll be able to read this ezine here and to get the archives too. The main issues on the Ezine Act 51 are about the crimes committed by the religious military regime in Sudan to explain that dictatorship crimes are not ethnical cleansing, especially in an environment such as Sudan, where most of the people are black. Even those who are Arabs, are not white. Interestingly, they are called "slaves" even in many Arabian countries. Tragicomically, at this comparison, Arabs are also called black, when they travel to the white world. African children, whether they are in Darfur, or in any other state in the Horn of Africa are the most vulnerable humans to such criminal acts of some of the wretched dictators in our world today… Dictators, whom Hitler would be ashamed of, if he had lived to see what they are doing. 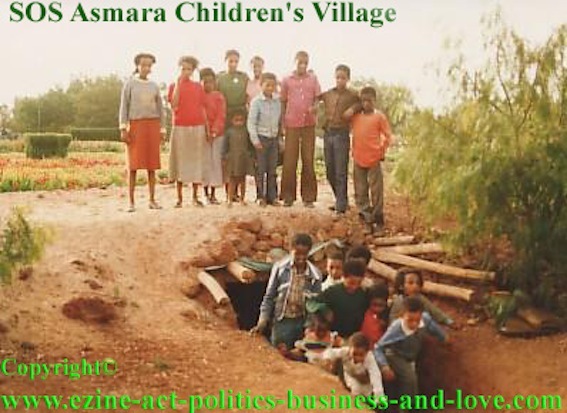 Ezine Act 51: SOS Asmara Children Village. Thank you for following up with the Ezine Act 51 and for any efforts to help us achieve these NOBLE goals out of this business. Please bookmark the Ezine Act Blog, or get to your account so you could read the updates. Use the orange button you see at the top left column. In This Issue of the Ezine Act 51! About Our Newsletters and Our New Website. The Dictatorship Crimes Are Not Ethnical Cleansing - 1! Powell Calls for Immediate Action to Secure the Sudanese Western Darfur Region! Annan Encourages the Sudanese Government to Work for Stability. Real Love - What's It! The Ezine Act 51 - Editorial on Politics! The news tell us something like this: Sudan's Arab-dominated government has been accused of supporting the Janjawid in a campaign to cleanse the region of black Africans, a charge it denies. We strongly respond to such claims and say that's not true. What happens in Sudan currently and what had happened almost in all of its modern history was that the civil sectarian and the military dictatorship took over poor to cause wars, economical crisis, health and cultural deterioration. The military dictatorship has created an Islamic Militia even from the black (and in fact we're all black as Sudanese) to wage wars against those revolted areas on the South and the west of Sudan. Those areas are still revolting as a result of the marginal regions' policy implemented by all of the civil sectarian and military dictatorship in Sudan and they all have conducted severe human rights abuse. This regional marginal policy is severely hitting the north of Sudan as well. So, any classification to the problem as a result of ethnical matter is not correct, or why should those who are claimed to be Arabs in the north be vulnerable to such conducts? See some relevant pages I have published couple of months after this issue and then came here to reedit it and supply it by this paragraph at About Darfur, Darfur Crisis, Darfur Rebels, Fur and Save Darfur Coalition. Let's call to submit all of those dictators and rebel's leaders to the International Criminal Court ICC! Please use any methods to support the Ezine Act 51 in this issue. Go to Amnesty International and even to the International Criminal Court and submit your support to the Sudanese people against those terrorists. Khalid Osman is a webmaster. He was a teacher and a journalist for more than 30 years. He wrought in Sudan, Iraq, Kuwait and Eritrea. He was a freelancer and he contributed to many newspapers and magazines published in London, Paris, Cyprus, Amman and Beirut. He's an activist in regard to the Environment, Press, Education, Trade Unions, Human rights, Children and Women (gender issues). Ezine Act 51 Behind the Misery Margins! * The U.S. Secretary of State Colin Powell called after a meeting on Tuesday with Sudan's president in Khartoum, for immediate action to secure the country's western Darfur region. The fighting between the Janjawid militia, created by the religious dictators and rebel groups has displaced more than 1 million people and killed up to 30,000. Powell reportedly urged President Omar al-Bashir to end the militia attacks, provide full humanitarian access, relaunch political talks with the rebels and allow more international monitors into the region. Just imagine this tragicomedy and remember how the USA assisted the religious parties during the 1940s to stand the growing power of the communist parties in the Middle East and Africa. And now they are negotiating with them, instead of smashing them. The only thing I can see is the capital interests between them. 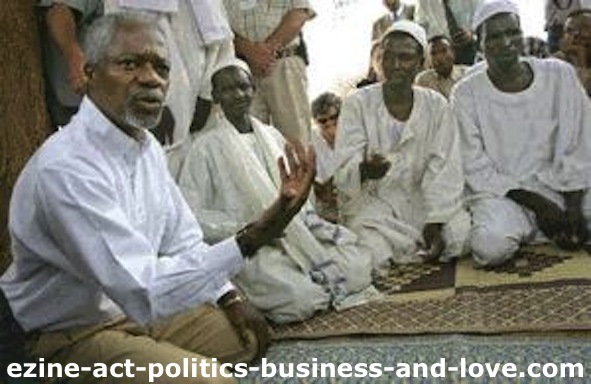 Annan Encourages the Sudanese Government to Work for Stability! * The U.N. Secretary General Kofi Annan encouraged the Sudanese government last Thursday to work for stability. Annan said he wants to see progress within two days to stop fighting in the western Darfur region. Ezine Act 51st Edition: Kofi Atta Annan, the 7th UN Secretary Genreal in Darfur, Sudan. Annan, paying attention to the camera, while talking to displaced Sudanese at a camp in the western Darfur region. Annan told Sudanese Cabinet ministers in Khartoum, "I think we all have a responsibility to act urgently to deal with the situation in Darfur." "We have worked together for a long time, and I hope this time we are going to take such measures that we don't have people in camps for years to come," he said. "I think we should be able to make some real progress in the next 24 to 48 hours." Annan also met with U.S. Secretary of State Colin Powell in the Sudanese capital, the same day the United States began circulating a draft U.N. Security Council resolution to impose an arms embargo and travel ban on Arab Janjawid militias blamed for attacks on African villagers in Darfur. * 10,000 people are likely to die in the next month due to deterioration on peace and human situations unless a massive humanitarian efforts with military backing is launched, said World Health Organization`s top expert on emergencies, David Nabarro. The Ezine Acts 51st Business Section! Hot Business Offers of the Ezine Act 51! The insight of this business offer are that, you'll never need to look out of your brain to improve your life, or to get some of the things that interest you well done. In addition to what you see on the market place of the Ezine Act 51, you may consider values to consider taking what interests you to make a living, or to make additional income. Use the search tool at the right column to locate what interests you by entering it into a search term, if you didn't find it here. The second thing to do is to look at what you have in your brain. That could be a hobby, a knowledge about something, a passion, or just some professional and personal experiences you have. Any of these values you have has demands on the internet and regarding your personal equity, you have you could provide that demand to large base of audience on the net. There is some ways to do this through a business evaluation process and a business building, automating, optimizing and monetizing process. They are all in what we call Site Build It, where you can find the required tools to do all of that. More here at: Love and Romance. Well, here we are now at the close of our newsletter. Khalid Osman, Ezine Act 51 Senior Publisher. Share Ezine Act 51 with your social media service. Pin one of the Ezine Acts Pictures on this page, or at the Ezine Acts Galleries, Ezine Acts Photo Gallery and Pictures for Your Website. I also encourage you to visit the political website to get more insights on the political issues you read on the Ezine Act 51. Thank you.